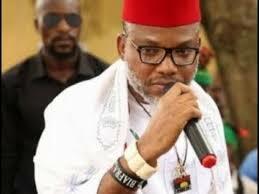 The Indigenous People of Biafra (IPOB) has called on United Nations, Britain, USA and other civilised nations to compel the Federal Government to produce its leader Nnamdi Kanu who was allegedly abducted by Nigerian Army on September 14, 2017, when soldiers invaded his home town at Isiama Afaraukwu in Umuahia, Abia State. The group urges the same Nigerian Army that allegedly abducted him (Kanu) to charge him to court or release him to the British Government. A statement by the Media and Publicity Secretary of IPOB, Emma Powerful, said that failure to release its leader was an invitation to anarchy because, according to him, the leadership of IPOB could not guarantee how long the simmering rage of the masses could be contained. Powerful said that Federal Government headed by President Muhammadu Buhari and the Nigerian Army must release Kanu and others abducted alongside him last year during the invasion of his compound, without further delay, or they can await the catastrophic consequences their extra-judicial killing spree will cause in the near future. “It is now clear to all and sundry that orchestrated sightings of our leader in Cameroon, Ghana, Niger Delta creeks, Malaysia, London and other weird and wonderful places were lies concocted and planted in mainstream Nigeria media to fool and confuse the public. “Nigerian Army abducted him when they raided his home with deadly intent”. “The periodic harassment of those that stood surety for our leader through Justice Binta Nyako’s court is a clever ploy to drum the false narrative into the brains of Nigerians that our leader jumped bail, when in actual fact it was the army that invaded his home and killed 28 people in the process. “Those in the habit of condoning the excessive human rights abuses of this APC government must know, in the words of one Sir Arthur “Bomber” Harris, ‘that he who sows the wind, will reap the whirlwind’. “Nigerian Government and her security operatives must produce our leader Mazi Nnamdi Kanu and others abducted with him last year. “A near derelict naval vessel stationed in the high sea is not a court of law where guilt and innocence are determined, that remains the exclusive preserve of a court of law,” Powerful stated.